Ken Stevens saying "on top of his deck"
1.2 Alternating voiceless and voiced sounds. This clip, and other clips elsewhere on this CD, are taken from a high speed x-ray movie of Kenneth N. Stevens, The original 35 mm cineradiography film was made by Sven Öhman and Kenneth Stevens at the Wenner-Gren Research Laboratory at Norrtull’s Hospital, Stockholm, Sweden, as described in an abstract of a paper by S. E. G. Öhman and K. N. “Cineradiographic studies of speech: procedures and objectives.” J. Acoust. Soc. Amer. 35, 1889 (1963), and in K. N. Stevens and S. E. G. Öhman “Cineradiographic studies of speech.” Quarterly Progress and Status Report, Speech Transmission Laboratory, KTH, Stockholm, 2/63, 9-11 (1963). The film was converted to DVD format and distributed at a conference at MIT in June 2004, honoring Professor Stevens, From Sound To Sense: 50+ Years of Discoveries in Speech Communication. 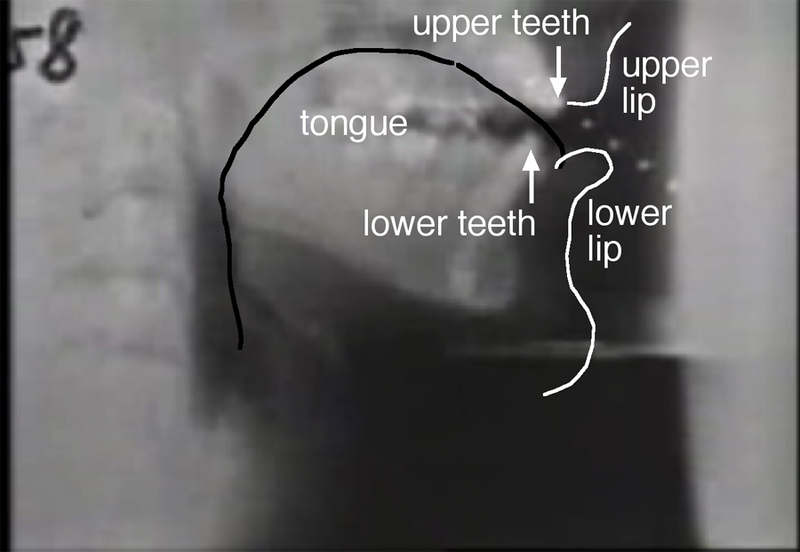 The film was part of the poster Articulatory KENematics: Revisiting the Stevens cineradiography, K.G. Munhall (Queen's University), M. Tiede (Haskins Laboratories), J. Perkell (Massachusetts Institute of Technology), A. Doucette (Industrial Light & Magic), & E. Vatikiotis-Bateson (University of British Columbia). The original film was described and analyzed in detail by Joseph S. Perkell in Physiology of speech production: results and implications of a quantitative cineradiographic study.Cambridge, Mass: M.I.T. Press (1969).